Here at PlaySmart Learning Center, we are an APPLE Child Care Center. Now you may be wondering what that means. APPLE stands for “Accredited Professional Preschool Learning Environment” and is a certification earned by the elite early learning programs in the nation. APPLE is accepted into the State of Florida’s Gold Seal of Quality program. This is what allows us to give your child the best experience possible. It is an honor to be APPLE-certified here at PlaySmart. There are thousands of early childcare education centers that apply each year. We’ve been able to pass all the APPLE certification processes with flying colors. We pride ourselves on being accepted, allowing us to solidify our promise and mission statement to truly provide an excellent education system. 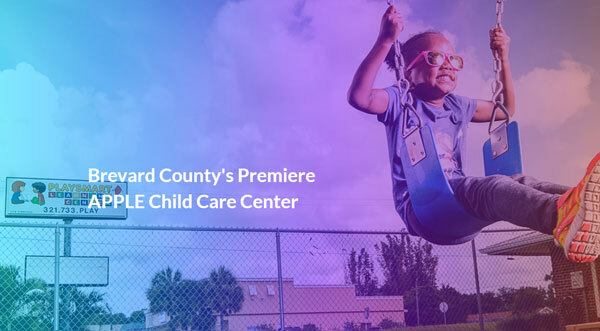 With that being said, here at PlaySmart Learning Center, Brevard County’s premiere APPLE Child Care Center, your child has the best opportunity to be prepared for the next level. Our kindergarten readiness rates are through the roof!